You might use many tricks to make the room look larger, but storage is actually a serious problem in small rooms. If you put cupboards and desks there, they will take up most of the space of the room. Therefore, the best solution would be to build open shelves. You can make a large shelf on one side where you can put up most of the stuff of your room. Open shelves will also make the room bigger than it actually is along with giving you space for other stuff. Another way to make your small room look stylishly bigger is to go for a monochromatic theme. This means carpets, walls and curtains to be of similar color or in a similar tone. This is a trick often used by one of the best interior designers in Lahore to make small rooms look spacious. The reason is that it gives the illusion of the walls receding into the ceiling hence making the room look bigger. If you think that a monochromatic theme is too boring, you can add in a little bit of color by adding in funky and bold decorations. Why put in a sofa, extra chairs and a bed when you can use an ottoman? That’s right if you want to fool the eye, go for furniture that can be used for different purposes, like an ottoman or a table which has shelves for everything. This is yet another way of making the best out of a small room. The lesser you use, the bigger your room will look. Over stuffing is a big no-no for small rooms. Many people try adjusting everything in a small room which is a huge mistake. Apart from some essential items, you must keep excessive furniture out of the room. Also avoid putting in extra decorative items. The less you put, the better your room will look. You might like bright and vivacious colors but if you plan to make your small room bigger, it is better if you stay away from them. Neutral colors such as grey, ivory, beige, peach and champagne tone down the room along with making it look big. 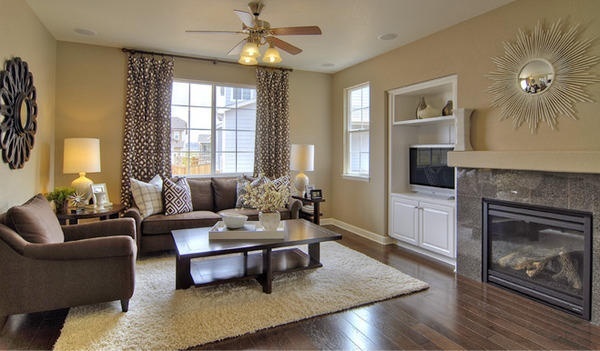 A neutral colored monochromatic theme is ideal for a small room. The above mentioned tips are simple and by no means difficult to follow. So forget about how large or small your room is, if you know how to, you can easily decorate any room.